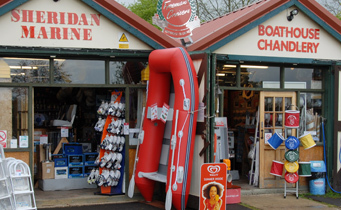 Established in 1972 the Sheridan Marine Chandlery is a comprehensively stocked boat store. Come and visit us by river or road; or pick up the phone. ...an Aladdins cave! 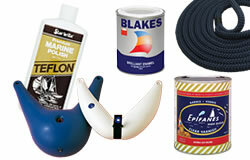 You will find all the basic boat parts, from Blakes & International Paint to Marlow & English Braids Rope. Along with fashionable deck shoes you will also find odd catches and fittings, traditional chrome and brass parts, stainless steel fixings & fastenings, light fittings, sinks & cookers, fridges & heaters and much more. We will help you with your problems such as window leaks, with new window rubbers to hand, GRP repairs and rubbing strakes of wood, aluminium and rubber, even pulpit rails are held in stock. Where else will you find such a mixture?! Come and browse, have an ice cream & coffee and sit by the side of the River Thames and relax as the world goes by. By appointment we will help you to design your boating projects such as Hot Water Systems, Shower Systems or Heating. Providing you are purchasing from the chandlery we will assist in the design and parts required and endeavour to help your project become reality in a practical manner which is as kind as possible to your pocket! The large wholesalers deliver weekly, with boat parts from famous trade names such as Plastimo, XM Yachting, Aqua Marine, Unipart Marine, Lanza & Timage, Aquafax, EC Smith and Jabsco & Rule to name a few. Phone us (01491 652085) or pop in to see if we have what you're looking for. If we don't we will do our best to find it for you! For directions and contact details visit the Visit & Contact Us Page. For more information on our chandlery and boating products please phone us or start shopping online. Phone us or pop in to see if we have what you're looking for. 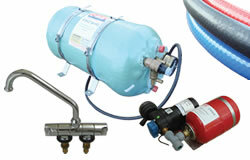 Suppliers of Calor Gas bottled gas.